Yay, college. Today marks the first day of my last semester on what will probably prove to be a largely useless degree. I am not, however, bitter. Why, one might ask, would a person not be bitter about a degree that has minimal job prospects and is mostly good for getting the next college to accept credits without a fight? Well, the second one is a fairly good reason. Transferable credits are nothing to sneeze at. But mostly, it’s the growing gap in higher education. Yes, for those out there keeping score, I do have issues with the whole education system! Horrific missteps in the gaining of knowledge isn’t only for kids anymore! Doesn’t it give you warm fuzzies? Okay, that’s exaggeration, but not by much. While a degree helps in my field, it is possible to just get started with an AP Style Handbook and natural aptitude. But my field is in the “evolve or die” phase, and so far it’s still clinging to the trees and complaining about how far down that ground is and who wants to walk upright anyway? There are, however, a great many fields that need a degree to get started. And for many of them, a Bachelors is today what an Associates used to be. That is, it’s the degree you have to get before you can get the degree that actually qualifies you to work in your field. Ok, a couple more years. So what? Kids are taking time off before college now, and living at home until thirty. There’s time, right? Nope. College is getting more expensive every year, in every way. Tuition goes up to match raises in taxes, cost of living and cost of services. Text books have been expensive since the dawn of time, but are getting more so, as publishers become more specialized and the various fields become unbreakable monopolies. 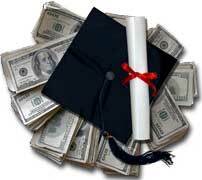 Student loans are going up to match the rising tuition costs. And since the loan companies have students over a barrel with no lube in sight, all students can do is shop around and hope the government can help. I have not a single thing against government aid. I don’t approve of abusing it, mind you, but I have nothing against its existence and use. Unfortunately, students who don’t have gobs of money to pay for school themselves but aren’t actually poor can’t touch that. A friend of mine has a dad who makes quite good money. Her mother, however, has the vicious version of diabetes, Type 1, and so when her parents income is adjusted for cost of living, there’s barely enough to get them through, much less help their daughter through school. But since FAFSA doesn’t adjust for cost of living (surprise) there’s no help. Which just leaves those nasty, nasty loans. Scholarships! Grants! Well, yes. But they’re difficult to find. And do you have any idea what it’s like to apply for $16-24,000 worth of scholarships and grants? The applications process alone is a full time job, 8 hours a day for a minimum of a week for the gamblers, and perpetuity for the conscientious, with no guarantee that it will pay off. And once on a scholarship, it’s a never-ending adventure to meet the requirements. Now imagine having five scholarships to fulfill. Oh, and still keeping up with classes. And with all of that being said, nothing in high school prepares a student for college. So even being accepted and getting the money doesn’t mean that it will be possible to make it through college. And finally, on top of all that, the middle class is vanishing under economic strain. The comfortable jobs that college earned a decade or so ago are rapidly becoming either so highly paid as to boost a person out of the middle class, or so common as to drop below it. And some are staying stable while the cost of living goes up. Debt levels all. Debt from earning those degrees eliminates their starting advantage and gives non-graduate workers time to catch up. So it’s actually possible, with care and practice, to live decently on income earned as a manager in a fast food restaurant, or (as my husband does, making excellent money) working in tech support, or a grocery store. Or, quite frankly, one of the hundreds of non-outsourceable local service jobs that have room for promotion or will hire for better paying positions based on experience. Experience that, unlike college, actually pays the bills to earn. And that living can, as experience accumulates, become just as comfortable. So, to recap; getting a useful degree takes longer; college is getting more expensive in every aspect; loans blow chunks and grants and scholarships are attainable, but difficult to find and wield properly; and the time spent versus debt accumulated to earn a useful degree is closing in on the point of being a losing situation for most degree holders. So, why am I not bitter about my nearly useless degree? Because I’m lucky. I got my degree entirely on the government’s dime because I have seven siblings. I got it at a community college that actively gives a crap about affordability and so didn’t have to pull loans to do it. And I’m lucky because I’m ahead of the tide. Very soon, I’ll have to start pulling down loans and hunting scholarships. But if my reading is right, I’ll clear the hurdle just ahead of the gap and make it out of this with a useful degree before the debt-to-income ratio shuts me out. To contact Jeremy Cloud, email communitywriter@occc.edu.